The PowerSource battery is a universal replacement battery for the following models: EF3000iSE, EF3000iSEB, EF4500iSE, EF5500DE, EF6300iSDE, and EF7200DE models. It is a Gel Mat (NOT ACID FILLED) battery. 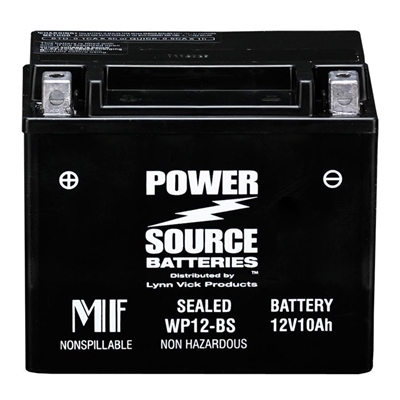 PowerSource WP Series batteries feature a completely sealed and maintenance free design. Factory pre-charged and Deep Cycle capable of up to 800 cycles for a typical user. Travel and shipping is made easy by being approved by the FAA, CAB, IATA, DOT, air transport and UPS. Power SourceTM batteries feature sealed construction to allow safe operation in any position. A specialized “oxygen cycle” recombines gases during overcharge so there is no need to add electrolyte, and they are factory precharged. Special separators, advanced deep cycle plate composition, and a carefully balanced electrolyte system have greatly improved the capability of recovering from deep discharge, up to 800 cycles. Nothing could be easier with Power SourceTM batteries. Leak-Proof construction virtually eliminates the need for special precautions, shipping containers, or government approval. High-Impact resistant ABS non-conductive plastic, styrene, or polypropylene make up the durable case and provides excellent resistance to vibrations, shock, chemicals, and temperature. Discharge currents of over ten times the rated capacity of the battery are a result of low internal resistance specifically found in Power SourceTM batteries. Smaller batteries may even be specific in applications requiring high peak currents. Low self-discharge rate permits storage of fully charged batteries for up to one year at room temperature before charging is required. Lower room temperatures extend overall life. Power SourceTM batteries may be discharged over a temperature range of -15°C to +50°C. Any VRLA-AGM battery will be damaged by continual undercharging or overcharging (Capacity is reduced and life is shortened), although PowerSource Batteries accept a charge very well due to their low internal resistance. Overcharging is extremely harmful to any VRLA battery because of the sealed design. Overcharging dries out the electrolyte by driving the oxygen and hydrogen out of the battery through the pressure relief valves which will lead to less capacity and shorter lifetime. If a battery is continually undercharged, a barrier layer of sulfate will build up on the positive plate which will impact recharging acceptability. Premature plate shedding can also happen. Performance is reduced and life is shortened. It is critical that a charger be used that limits voltage. The charger must be temperature-compensated to prevent under or overcharging due to ambient temperature changes. The warranty is void if PowerSource Batteries are improperly charged. Use a good constant potential, temperature-compensated, voltage-regulated charger. Constant current chargers should never be used on VRLA batteries. If the battery has high temperature or poor ventilation during storage and delivery, the self-discharge will increase. So, keep good ventilation and keep away from fire, flame, heat supply etc. When storing the battery, take it off from the charger and load and keep it in the dry and cool place. Please supplement charge before use when the battery has been kept for a long time. 1. Keep batteries in a place where children cannot reach. 2. Do not attempt to disassemble, revise, damage, impact, dispose batteries, otherwise the battery can leak, be overheated, or explode. 3. Do not dispose of the batteries in water, fire, and do not heat the batteries. 4. Do not short batteries. 5. Do not put your face near the top of batteries. Please wear gloves and eye protection when you measure or repair batteries. 6. There is sulfuric acid in the battery. Do not make contact with sulfuric acid and skin, clothes, or especially your eyes. If eyes make contact with sulfuric acid, please wash with a lot of clean water, and consult a physician immediately! are defined as: discharging temperature range: -15° C~ +50° C ; charging temperature range 0° C~ +40° C .
Was not the exact size but it will work. It said that it was a replacement for a Yamaha EF6300 iSDE but it turned out to be not exactly the same. So the battery on my Yamaha generator went dead and I needed a replacement battery. I called and talked with a real person giving the model number of my generator and the battery I needed. He referred me to a battery that was a different number but said that it would work just as well. OK I bought it. Upon installation I found that the terminals were on the wrong side so the leads to the battery weren't long enough but I made some modifications so they would reach. Then discovered that the battery was shorter than the original and so the battery clamp didn't clamp down far enough to reach the battery and hold it in place. Again I had to make some modifications to the clamp to that the battery would be securely held in place during vibration. The battery works to start the generator but it is not a good fit and I suspect that the help on the other end of the line didn't really know what he was talking about. received on time, fully charged and ready to go! A great one!! Ordering was easy and arrived quickly! Great website !! Looking forward to order more stuff from you all real soon!!!! Item received in good condition and as described.